Despite the small beginning of Nano Nagle in 1775, the Presentation Sisters spread throughout Ireland and several parts of the world. Historical and legal factors meant that the different convents of the Congregation developed into independent houses, but the spirit of Nano Nagle continued in persons and communities as they responded to the call of God in their lives and lived out that call in a relationship of love, of service and of care. 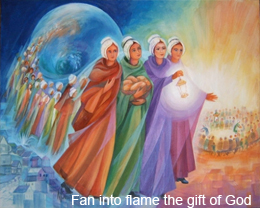 Following Vatican II, many of these independent convents of Presentation Sisters joined together into The Union of the Sisters of the Presentation of the Blessed Virgin Mary. The communities involved were mainly those in Ireland and some who had gone out from Irish communities. This Union was officially established by Papal decree on July 19, 1976. There are many other groups of Presentation Sisters, which were founded in the eighteenth and nineteenth centuries. These are not part of the Union, but they too are members of a living past, ministering across the globe.